Club 21 SALE 2014 Bazaar offers Spring Summer Fall Winter designer branded bags, accessories, apparels for men, women and kids. Get a designer wardrobe from your favourite fashion brands from CLUB 21 designer labels, selected seasonal collections, collaborations and collections at up to 90% off. 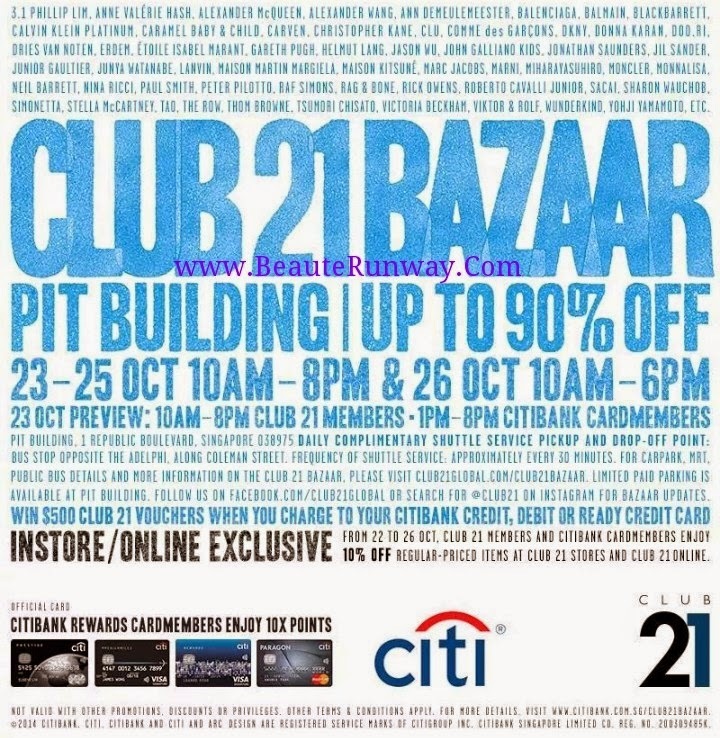 Club 21 2014 bazaar sale venue is located at F1 Pit Building, 1 Republic Boulevard (near The Singapore Flyer) from 23rd to 26th October where 23rd October is open exclusively for club21 members PREVIEW SALE from 10am -8pm, Citibank card members from 1pm to 8pm. Public sale dates are October 24-25, 10am to 8pm and October 26 from 10am to 6pm. Happy club21 sale hauling. Club 21 brands designer labels : Alexander Wang | Acne |Alexander McQueen |Ann Demeulemeester |Anne Valerie Hash |Armani Collezioni | Armani Jeans |Armani Junior | Balenciaga | Balmain |Berluti | Blackbarret | Comme des Garçons | Craven |Christopher Kane | CLU |Club 21 | Club 21 Accessories |Club 21b | Club 21 Gallery | Club 21 Men | ck Calvin Platinum |COMO Shambhala |Dior baby |Diesel |DKNY |DKNY JEANS | DKNY KIDS |D&G |Dolce & Gabbana |Donna Karan |Dries Van Noten |Erdem Emporio Armani |Giorgio Armani | Gareth Pugh |Issey Miyake |Helmut Lang | Jil Sander | John Galliano | Junya Watanabe | Jason Wu |Jonathan Saunders |Kids 21 | Lanvin | Marni | Marc Jacobs |Marc by Marc Jacobs |Monnalisa | Nina Ricci |Paul Smith | Peter Pilotto |3.1 Phillip Lim | Pomellato | Raft Simmons |Rag & Bone | Rick Owens |Sass & Bide |SuperNature |Thakoon | Thom Browne | Tsumori Chisato |Victoria Beckham | Viktor & Rolf and more. There will be a FREE CLUB 21 Shuttle bus from Aldephi and Pit Building at 30 minutes interval from October 24-25, 10am to 8pm and October 26 from 10am to 6pm. Take SBS or SMRT Buses 56, 75, 77, 97, 171, 195, 960, 36, 97, 106, 111, 133, 502, 518, 857 and walk to Singapore F1 Pit building or catch the MRT to promenade station as there are limited car park lots available. Join Beauterunway Facebook for updates, Share the great news with your friends and Happy Shopping ! LUXASIA Warehouse SALE 2014 offers designer Beauty| Cosmetics| Makeup| Skincare| Fragrance| Perfume| body care| hair care, coffret sets and limited edition brands collectibles at up to 80% OFF. 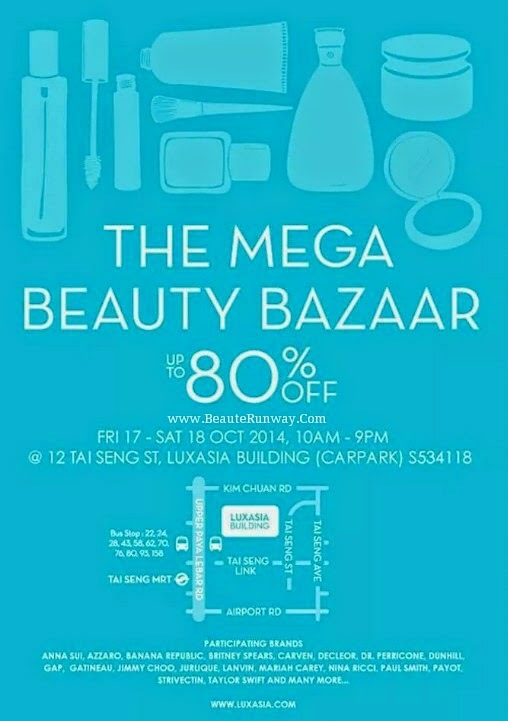 Brands and prices for Luxasia Beauty Bazaar Warehouse SALE 2014 should be similar to previous Luxasia Warehouse Sale 2010, Luxasia Warehouse SALE 2011, Luxasia Warehouse Sale 2012 and Luxasia Warehouse Sale 2013. Happy Luxasia SALE Hauling. LUXASIA fragrances Brands available : Acqua di Parma | Amouage | Aspen |Aigner| Anna Sui| Annick Goutal| Burberry| Bvlgari| Boucheron | Balenciaga | Balmain | Craven |Calvin Klein|Chloe| Davidoff| Ferragamo| Hermes| Issey Miyake| jimmy Choo | Diptyque| La Lebo | Maison Francis |Carita| Lanvin| Dunhill | La Perla | Marc Jacobs| Narcisco Rodriguez| Nina Ricci | Paul Smith| Paco Rabanne| Prada| Stella McCartney| Van Cleef & Arpels| Yves Saint Laurent|Valentino Valentina | Vera Wang| Taylor Swift| Celine Dion| Mariah Carey| David Beckham| Jennifer Lopez| Britney Spears| Sarah Jessica Parker|Halle Berry| Kate Moss| Gwen Stefani Harajuku Lovers| Guerlain | Joop| Banana Republic | Gap |Kenneth Cole| Reppeto | Lancaster| Daisy by Marc Jacobs| Quiksilver| Roxy| Thierry Mugler| Azzaro | The Different Company| Esprit| Clean Fragrances and more. Do share this link with your friends and join BeauteRunway.Com FaceBook https://www.facebook.com/pages/Beaute-Runway/209643823320 for more updates on beauty, fashion and shopping ! LUXASIA Warehouse SALE 2014 Mega Beauty Bazaar offers Branded Skincare|Fragrance| Beauty| Cosmetics| Makeup|Perfumes| body care| hair care and more at up to 80% OFF at Luxasia Singapore Office located at 12 Tai Seng Street, Luxasia Building Carpark, Singapore 534118 on October 17th and 18th (Friday and Saturday), 10am to 9pm, accessible within 10 minutes walk from Tai Seng MRT, Circle Line or SBS bus no. 22, 24, 28, 43, 59, 62,70,76,80, 93, 159. Celine and Givenchy 2014 LUXURY SALE featuring Spring Summer | Fall Winter leather bags, small leather goods, clutches, Shoes, belts, sunglasses, hats, cufflinks, Accessories, Ready-To-Wear Women and Men Collection is by FJ Benjamin Group, Singapore. 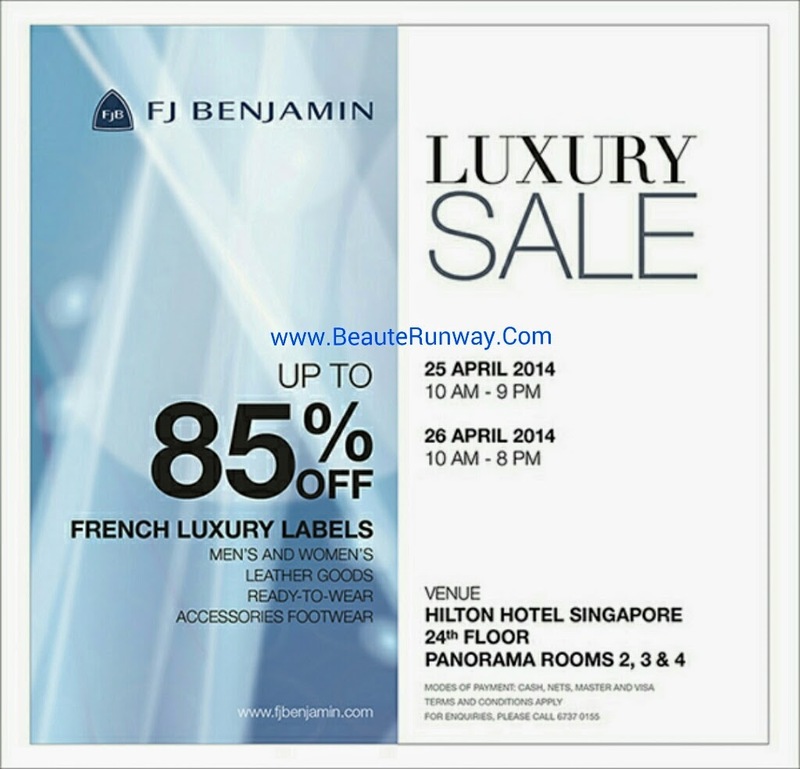 FJ Benjamin Designer SALE 2014 venue is located at Hilton Hotel, Singapore, 581 Orchard Road 238883, 24th Floor, Panorama Room 2, 3 & 4 on April 25th from 10am-9pm and on April 26th from 10am-8pm. Enjoy up to 85% off ready to wear, bags 40% to 70%, accessories and shoes 60% to 80% off the Luxury French Designer Labels, payment by MasterCard,Visa, Nets and Cash. 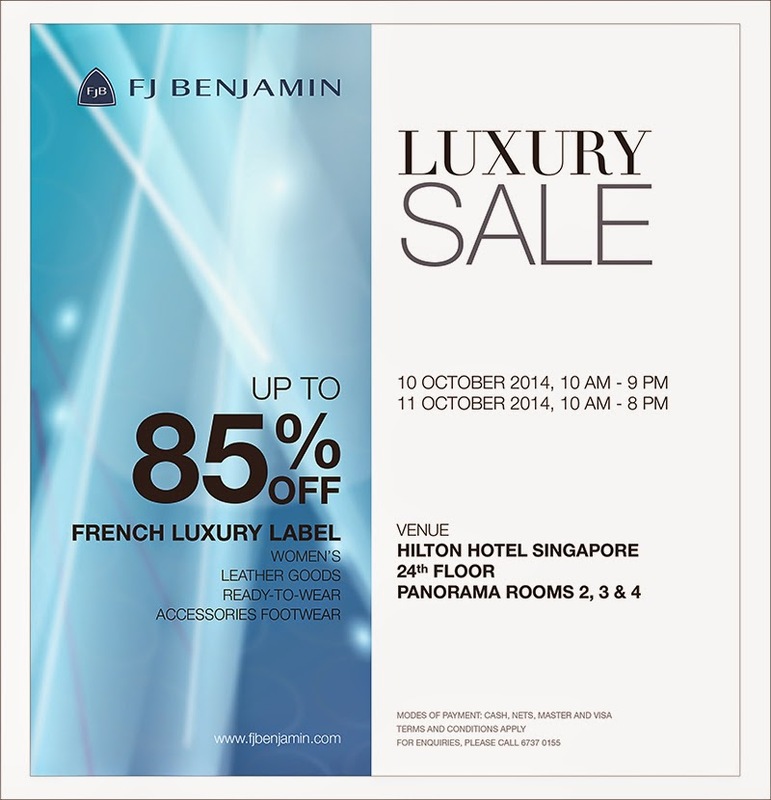 Givenchy 2014 Celine LUXURY SALE by FJ Benjamin Designer SALE is located at Hilton Hotel, Singapore, 581 Orchard Road 238883, 24th Floor, Panorama Room 2, 3 & 4 on October 10th from 10am-9pm and on October 11th from 10am-8pm. Enjoy up to 85% off ready to wear, bags 40% to 60%, accessories and shoes 60% to 80% off the Luxury French Designer Labels, payment by MasterCard,Visa, Nets and Cash. FJ Benjamin SALE 2014 retailing luxury brands Celine and Givenchy Spring Summer 2013/Autumn Winter 2012 and Past Seasons Collection is located at Hilton Hotel Singapore and open to the public.